Flying to Trinidad from the U.S.A. It's a long way to Trinidad and Tobago. The Caribbean Sea is to the southeast of the United States, and Trinidad and Tobago are at, or actually a little beyond, the extreme southeast corner of that sea. Much of the South American nations of Venezuela and Colombia are closer to the continental U.S. As we will see below, Trinidad and Tobago are part of the South American continental landmass, they aren't part of the Antillean island chain. I went to Trinidad in January. I had left home in Indiana by driving an hour and a half to the Indianapolis airport through high wind and rapidly accumulating snow. I flew on Continental Airlines, since absorbed into United, through Houston. We left Houston at 1300 and arrived at Port of Spain at 2020, both local time. Given that Texas was at UTC-6 and Trinidad at UTC-4, the flight took 5 hours and 20 minutes. Four inches of snow had fallen during my drive to the Indianapolis airport. There are flights to Trinidad from Miami, Houston, New York and Newark, plus possibly some flights on Caribbean Airlines from Fort Lauderdale and Orlando in Florida. However you get there from North America, it will be a longer flight than to any other Caribbean destination. It seems that most of the few Americans who visit Trinidad and Tobago stay in resorts, many of those on Tobago, and they mostly stay within their resort compounds. 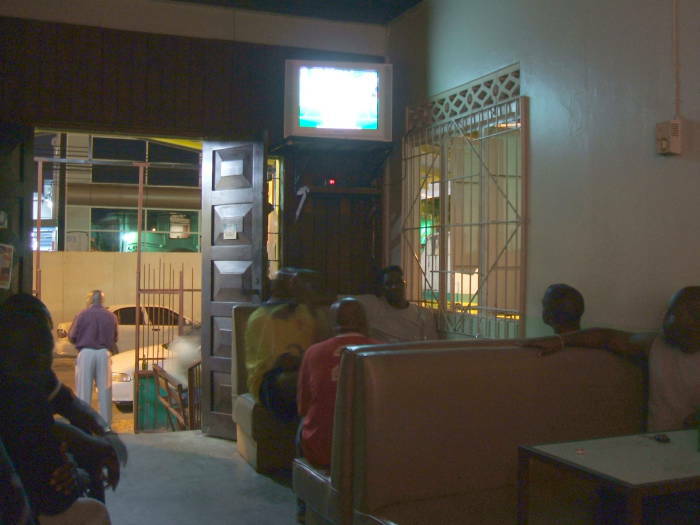 I was staying in Port of Spain, in a hotel while I was working and then in a nice low-cost guest house. I was interacting exclusively with the locals. I didn't see another American until I returned to the airport to fly out. I found The Rough Guide to Trinidad & Tobago to be very helpful for planning my trip, understanding what I was seeing, and even picking up some of the local terminology with which I could delight the locals I was working with. They would ask me each day what I had done the evening before, and I could tell them first I took the maxi-taxi to town and changed clothes. I had a casual lime (and it was a sweet lime), and then I went to get a roti. I heard the engine room in the mas camp really pounding it out, mon. And so on. As for other reading to prepare for your trip, try The Rum Diary, by Hunter S Thompson. It's about Puerto Rico, but all the same it gives you some idea of what Caribbean island life is like. It's great writing, whether you're headed to the tropics or not. 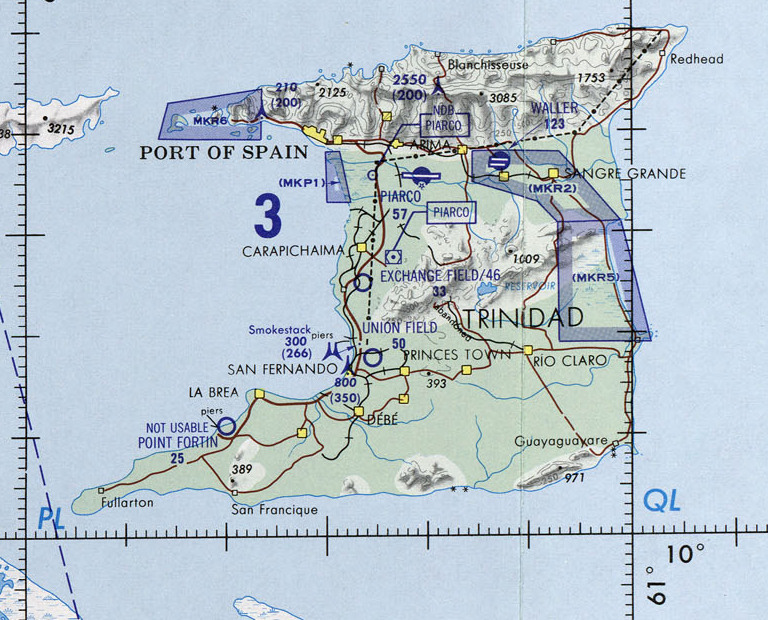 This map, a small section from a U.S. government Operational Navigational Chart, shows how Trinidad and Tobago lie just off the Venezuelan coast. It's just 11 km from Trinidad to the northeastern coast of Venezuela. It's 130 km north to Grenada, the first island you would reach in the Grenadines, and from there on north along the arc of Antillean islands. 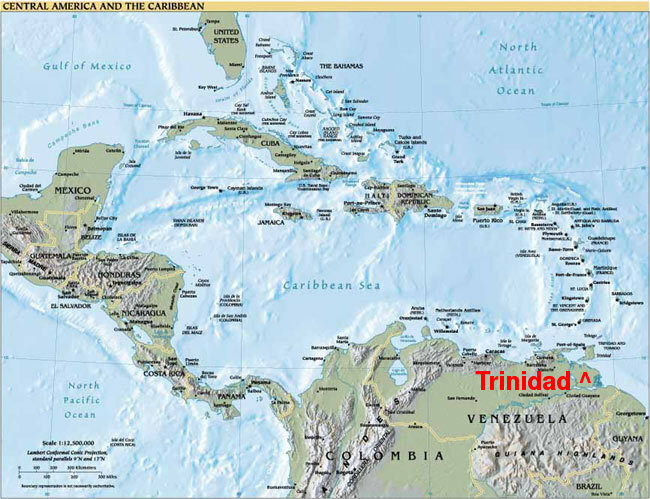 Trinidad and Tobago are not part of the arc of Antillean islands. Trinidad is on the South American continental shelf and was once, in a time of much lower sea levels, part of the South American landmass. The Gulf of Paria is a large shallow inland sea connected to the Caribbean Sea and Atlantic Ocean only through two narrow straits between Venezuela and Trinidad. You can see in this map how the coastal mountain range along the Venezuelan coast continues across the north shore of Trinidad. The Gulf of Paria was named Golfo de la Ballena or the Gulf of the Whale by Christopher Columbus, but the whales were all killed in the 19th century. It's brackish water, with salinity below 23 parts per thousand during the wet season. A great deal of fresh water enters the gulf from the rivers in Venezuela. Much of Trinidad's petroleum and natural gas resources, accounting for 40% of the GDP and 80% of exports, comes from underneath the Gulf of Paria. Here is a cropped section of an aeronautical chart, an ONC or Operational Navigation Chart published by the U.S. Department of Defense. It has been cropped way down to show just Trinidad and Tobago and some of the nearby Venezualan coast. It has also been downsampled to 50% of the original resolution. It's from the great Perry-Castañeda Map Collection at the University of Texas library. 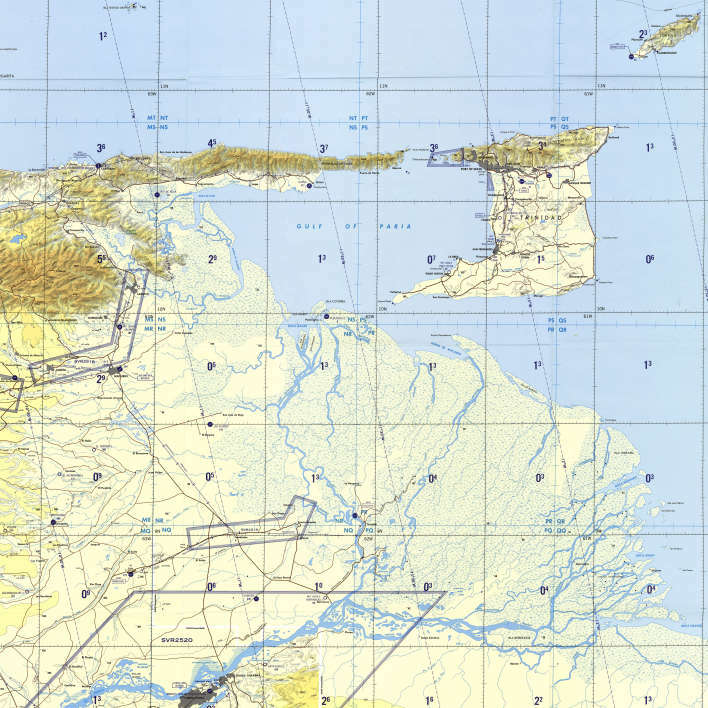 The Venezuelan coast, largely a mangrove swamp in the vast Orinoco river delta, is almost uninhabited and is only vaguely mapped. Trinidad's first settlers arrived from northeastern South America around 5000 BC. These people, called Archaic or Ortoiroid, had not yet mastered either ceramic technology or agriculture. Ceramic-making people called the Saladoid arrived around 250 BC. From here they continued north through the other Caribbean islands. A third group, the Barrancoid people, arrived from South America after 250 AD. A new group called the Mayoid cultural tradition arrived around 1300, largely replacing the existing cultures. The Mayoid culture was predominant when the Europeans first arrived in the form of Christopher Columbus' third expedition in 1498. This group included the Arawak-speaking Nepoya and Suppoya peoples, and the Carib-speaking Yao people. The natives were largely wiped out under the encomienda system of the Spanish colonizers. This system was basically slavery, in which the Spanish forced the natives to work in exchange for Spanish "protection" and conversion to Christianity. Spanish rule and immigration by Martiniquin planters continued until the Spanish surrendered to a British fleet in 1797. This left Trinidad a British crown colony with a French-speaking population and Spanish laws. Slavery was ended ten years later. 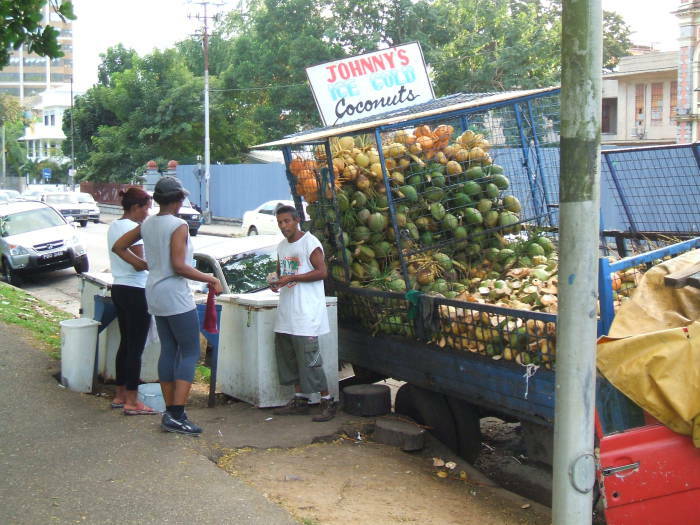 That left Trinidadian planters short on labor, so they imported workers starting in the 1830s and continuing until 1917. The first waves of workers were free West Africans, Chinese, and Portuguese from Madeira. 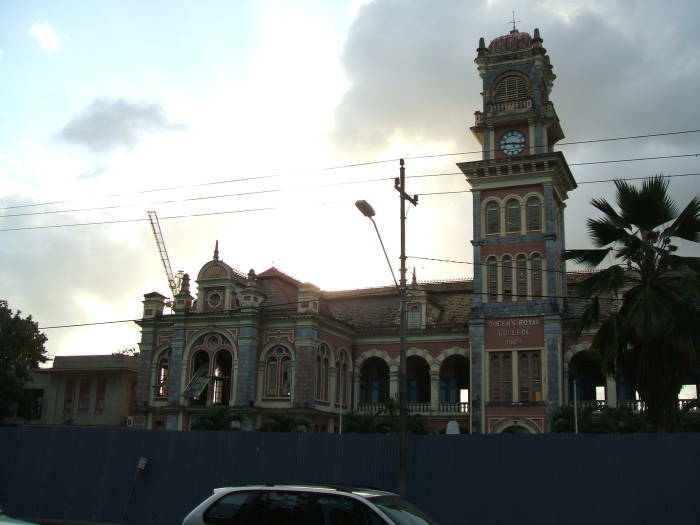 Starting in 1839, indentured servants from India were transported to Trinidad. Piarco International Airport is the main national airport. It's a 25 km drive outside Port of Spain, in the Piarco Savannah south of the main mountain ridge running along the north side of the island. It housed the U.S.A.A.F. 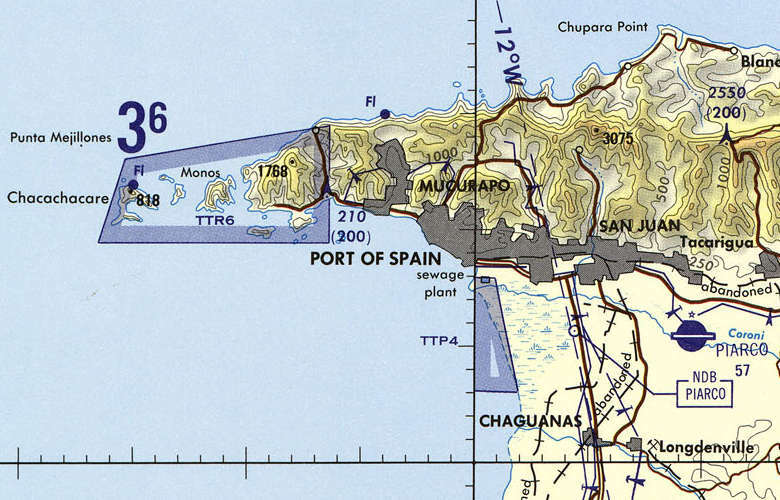 Sixth Air Force during World War II, when it was used as a transport airfield and for antisubmarine patrol flights over the southern Caribbean. The airport was expanded in 2001 and now has a 10,500 foot runway. The Chaguaramas peninsula extends to the west of Port of Spain. The entire peninsula was leased to the U.S. in 1940 for the construction of a naval base. From 1958 into the early 1960s it was a BMEWS early warning radar site and a missile tracking site for the U.S.A.F. Eastern Test Range. The U.S. military operation was scaled back in 1956, and the peninsula was returned to Trinidadian control in 1963. The national government still has several facilities here. 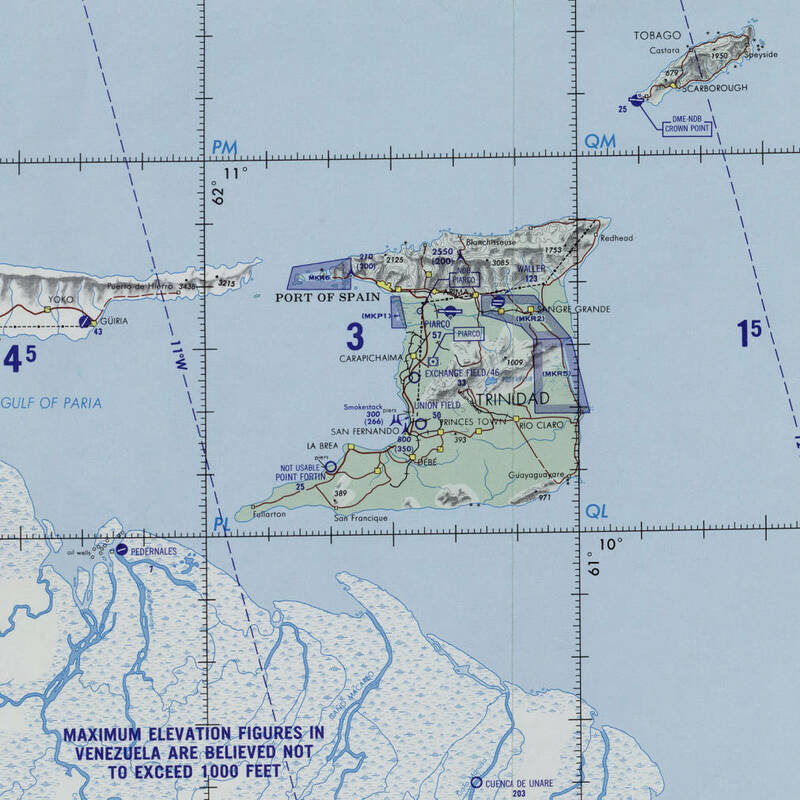 The TSTT facility where I worked was near the radio tower marked on the map (at the eastern edge of the marked MKR6/TTR6 special-use air space). It was up in the evening and dark for over an hour before my flight got in. Sunrise and sunset are rapid in the tropics, as the celestial bodies appear to move nearly vertically. When the Sun goes behind the horizon, it doesn't slip along nearly parallel to it, just below the horizon and still providing plenty of light. It just drops straight down and it gets dark fast. I was questioned by the customs agent. "Do you have any TING from dis tele PHONE compa NEE?" Well, I have this print out of an invitation letter that was mailed to me. "Dat's good, mon." I think I'll like Trinidad. Now to exchange some currency to get some TT$ to pay for a ride to the city. It was 6.4 TT$ per US$ when I was there. Then, a long ride in a big US model car with right-hand drive, to the hotel where the business was putting me up in north-central Port of Spain. We drove with the windows down, the warm and moist air blowing in. 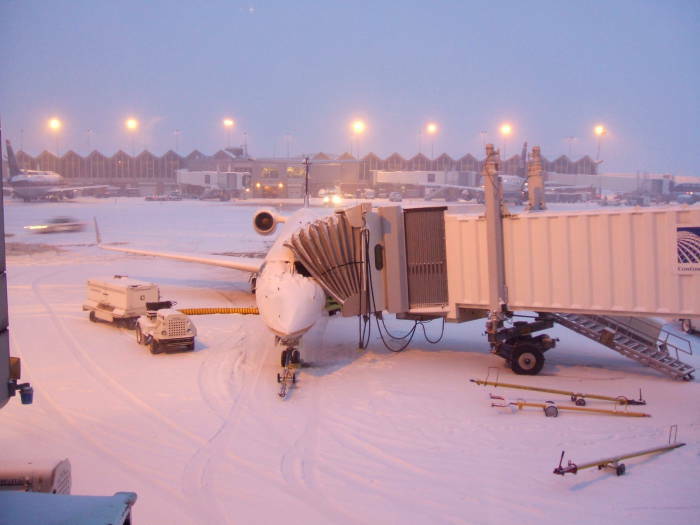 The smells are more intense in the tropics, especially if you just came from a cold and windy area covered with snow. The company I was working for had set up a room for me at the Kapok Hotel. It was a nice place to stay. This is a business-oriented hotel in the north central part of Port of Spain. There are U.S. chain hotels, but I would prefer to stay here if I were on a business trip. U.S. chain hotels seem like you're in the U.S., while staying here feels like you're actually in Trinidad. There is a restaurant and lounge on the top floor. At night you can't make out very much, but the views in the morning are fantastic. Here we are looking southwest. The Gulf of Paria is to the left, with oil rigs and oil tankers visible on the horizon. Straight ahead we are looking down the south coast of the peninsula, toward where I will be working. Here we have turned to look northwest, to the hills rising above the north edge of Port of Spain. Trinidad is tropical and parts of it are mountainous. Trinidad has three mountain ranges running east to west. They are continuations of the Venezuelan coastal cordillera. 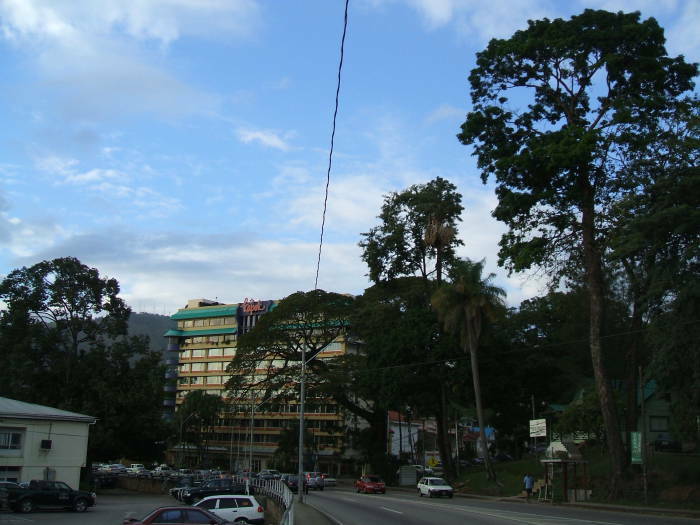 The Northern Range, rising from the north side of Port of Spain, has the highest terrain in Trinidad. El Cerro del Aripo rises to 940 meters or 3,085 feet. 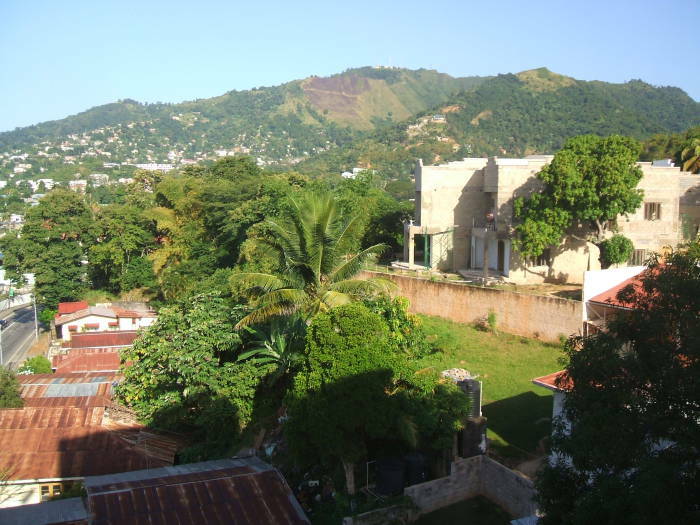 What you see here are the southern slopes of the Northern Range, on the north side of Port of Spain. Trinidad's past as the edge of the South American continent gives Trinidad a greater variety of tropical vegetation and wildlife than most West Indian islands. 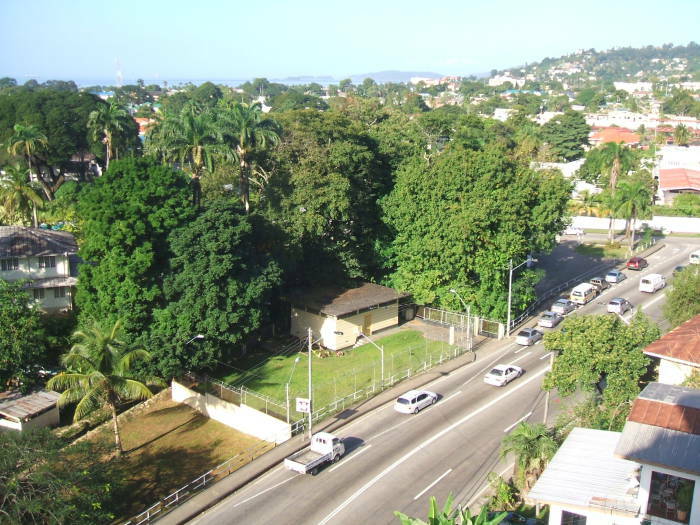 From here, Maraval Road leads south past Queen's Park Savannah toward the center of the city. 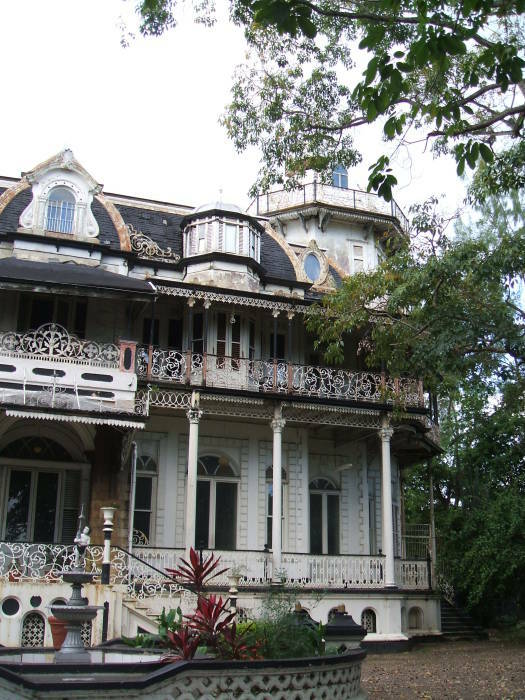 Killarny is a colonial mansion along Maraval Road beside the Queen's Park Savannah, one of the Magnificent Seven such mansions. It's also known as Stollmeyer's Castle. 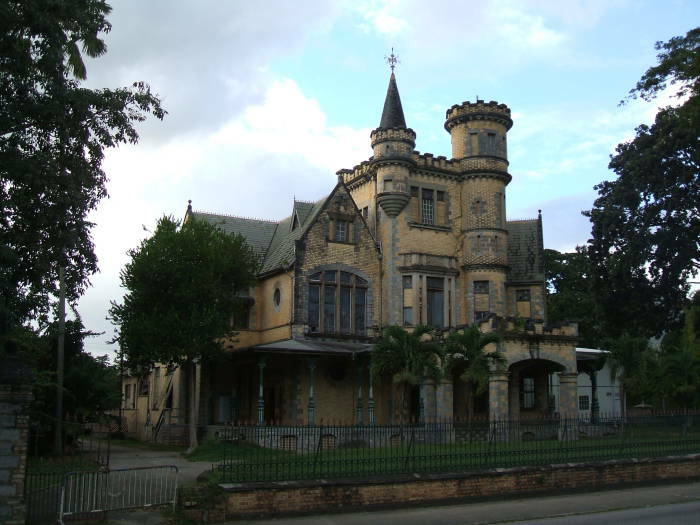 Of this one an architectural critic said, "A German built a bit of an untypical Scottish castle in Trinidad and called it by an Irish name. 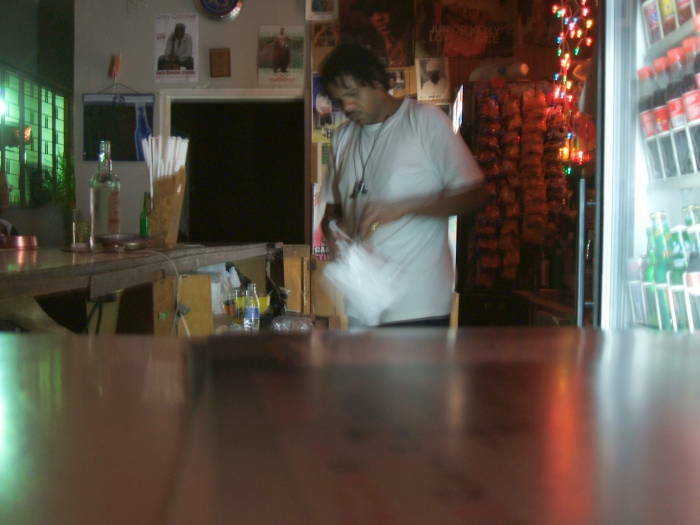 He must have been by that time a Trinidadian, because only Trinidadians do these things." 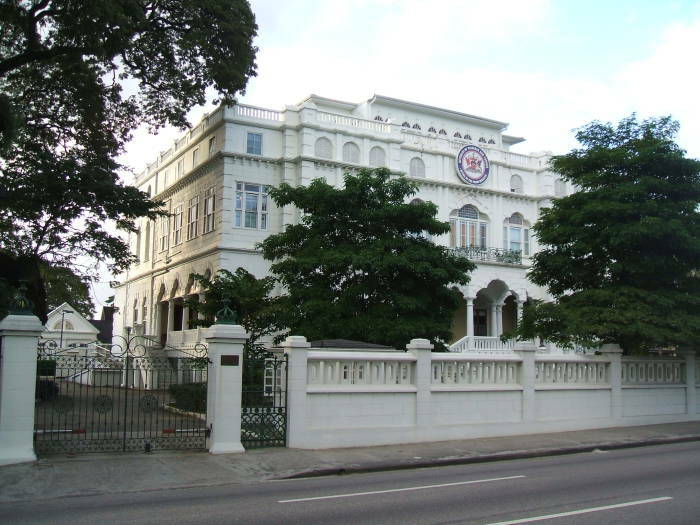 Whitehall is also a colonial mansion along Maraval Road beside the Queen's Park Savannah and another one of the "Magnificent Seven". Whitehall is the Prime Minister's office. I saw the Prime Minister's motorcade leave work one afternoon. He waved to everyone along the street. That's very much the friendly Trini attitude! Here is another one of the "Magnificent Seven", those colonial mansions along Maraval Road beside the Queen's Park Savannah. 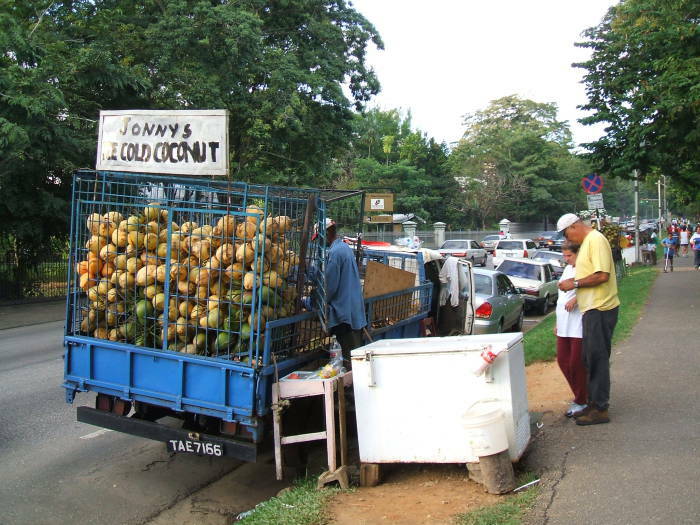 These coconut vendors are on Maraval Road beside the Queen's Park Savannah. 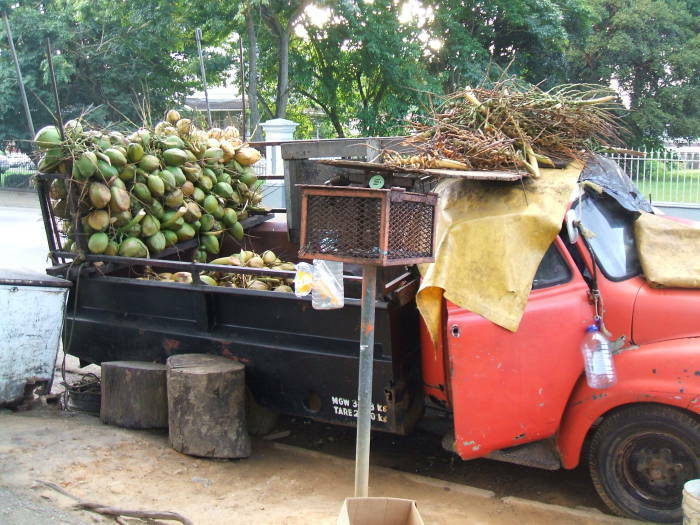 It seems that you can buy fresh coconuts along this road every night that coconuts are in season. I have no idea just when coconut season might be, but I was here in late January. 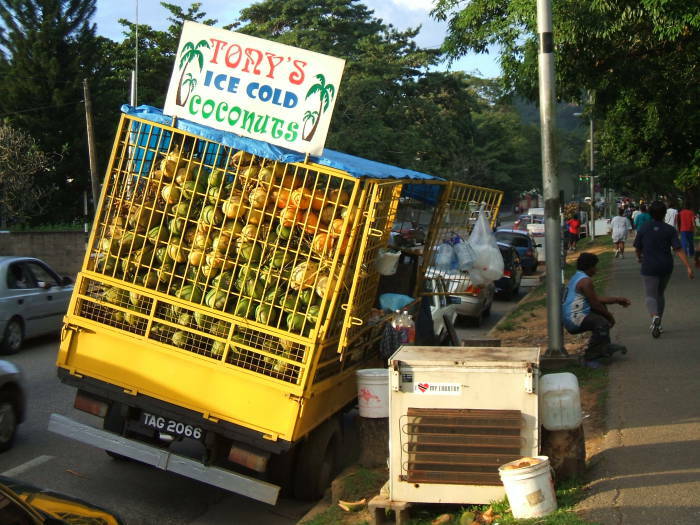 You can see that coconut temperature is an important feature touted by the vendors — "Sonny's Ice Cold Coconut", "Tony's Ice Cold Coconuts", and "Johnny's Ice Cold Coconuts". Queen's Royal College is the largest of the "Magnificent Seven". As its name indicates, this much larger structure is actually a college. But, in this case "college" means a secondary school. The authors V.S. Naipaul and Shiva Naipaul graduated from here. Sir Vidiadhar Surajprasad Naipaul won the 2001 Nobel Prize for literature. This little pub is along lower Maraval Road. It always seemed a bit like it belonged at the Mos Eisley spaceport. But it was extremely friendly. Whenever I happened to notice, which was seldom after the first day, I would realize that I was the only white person in sight (other than a few petroleum and bauxite businessmen staying at the Kapok). But it was no big deal — Trinidad is very friendly, very welcoming, and race seems to be largely ignored there. The one time I was aware of race and a little disoriented was when I went to the airport to leave. I was startled as I wondered, "Where did all these white people come from?" I had seen maybe five in the past week, but there were hundreds at the airport. It seems that most American visitors to Trinidad stay within resorts and don't venture out onto the streets with the Trinis. That's too bad, as they're missing the true culture of the place.